Walk into a place to buy perfumes and you are overwhelmed with choices. What brand, what type, and what fragrance would go best? is always a confusing affair. Undeniably, perfumes and fragrances, or even deodorants are a quintessential part of any outfit. I for one am crazy for fragrances and often use them at home, after a bath too! 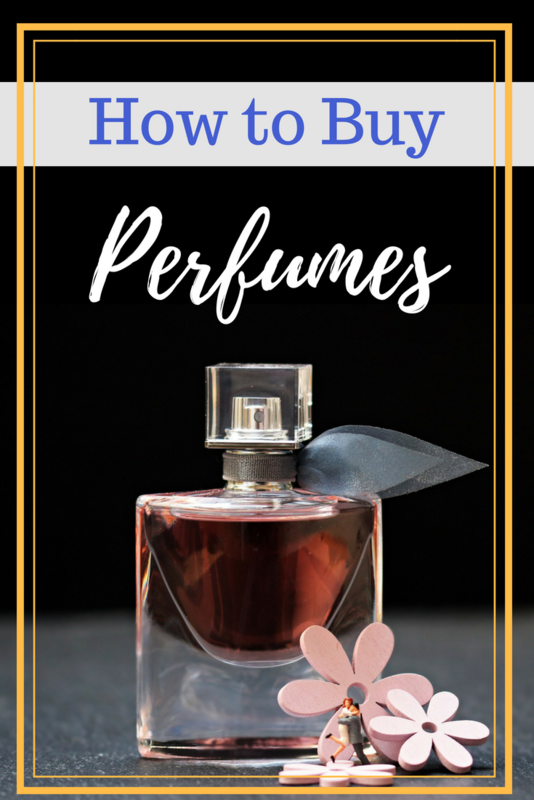 Making this triumph easy forever, here are some knick-knacks about how to buy perfumes, the difference between various kinds, and some of my recommendations that I personally love! Perfumes are fragrances blended with alcohol. No, not the one people consume, but the one that is often used in the beauty and medicinal Industry. The fragrances are often derived from essential oils. Multiple oils and fragrances are mixed to get that typical fragrance a certain perfume has. So when you go out to buy perfumes, you must read the inscriptions on the bottle. Perfumes have varied uses and are usually classified as daytime perfumes, and nighttime perfumes. Perfume bottles often state the timing for use, but even if they don’t, you can figure it out by the color of the perfume. Bright yellow, orange, and such sunny colors mean it is a day perfume. Perfumes that are in darker colors like red, dark blue, purple and the like, mean that they are meant for night time wear. It is a good idea to buy perfumes for varied uses. Daytime fragrances yield fragrances gradually and slowly since they have to last longer. Night time fragrances have a shorter life. These are mainly meant for dinners, dates and any other evening purposes. How to Apply A perfume? A perfume is best applied on skin that is well moisturized after a bath. A smooth and nourished skin tends to hold the fragrance longer. Perfumes should be applied directly onto skin, instead of the clothes, as they tend to leave water signs, which is quite unsightly. Perfume should be sprayed on to your skin directly, from a distance of about 5-7 inches. If the perfume wets your skin, you are holding it too close. Spray perfume on your pulse points. Pulse points are spots on the body that have blood vessels, up close to the skin’s surface. These points are warmer than the rest of the body. When perfume is sprayed at these points, the heat helps the fragrance to gradually release into the air close to you. This makes your fragrance noticeable quite conveniently. Pulse points are mainly knees, collarbones, and the neckline. Also popular are the insides of the wrist, the back of your earlobes, inside of your elbows. Some even apply it to their belly buttons. Reapply your perfume every four hours. Even the most long lasting ones do not stay for more than four hours. Before you buy a perfume, keep the kind of perfume in mind. The higher the concentration of fragrance in the perfume, the more long lasting it is. Extrait de Parfum, also known as Parfum or Pure Perfume has the highest concentration of concentrated fragrant oils. Parfums may consist of concentrations between 15% to 40%, however, most often the concentration is between 20% to 30%. They are the most effective of perfumes and tend to last to up to 7 to 8 hours. They are also the most expensive of variants for the same reason. People with sensitive skin choose to buy Parfum, as it seems to be the best choic. The amount of alcohol is lesser, preventing the skin from becoming dry. That is why, when out to buy perfumes, see if you can lay your hands on a Parfum. Eau De Parfum has the next highest concentration of fragrance in their perfume. With fragrance concentration between 15% to 20%, an EDP lasts for up to 4 to 5 hours. They are one of the most common types of perfumes bought and are suitable for everyday wear. Some people consider it to be primarily a nightwear perfume. Eau de Toilette or EDT has a fragrance concentration of 5% to 15 %. The concentration is less than EDP and Parfum, but EDT is cost effective. Eau De Toilette is, therefore, one of the most popular of perfume types. Most people buy Eau De Toilette for daytime wear. EDC or Eau DeCologne has the least of perfume concentrations. With a concentration of 2% to 4%, the fragrance or scent of the Eau de Cologne stays for about 2 hours, or sometimes even less. These are more popular because of their budget-friendly nature. This is why when we go out to buy perfumes, these are the most affordable. Nike Women’s Casual comes in a 75 ML bottle. Police to Be Rebel comes in a 75 ML bottle. I absolutely love the fragrance and the funky bottle. It is a collectors pride. Calvin Klein Euphoria Women Eau de Parfum. This bottle is available in a 50 ml bottle and the fragrance is absolutely out of this world. If you liked reading this article, SHARE it ahead. You may also like to read: Can Learning Music Affect a child’s brain? Nice and detailed post. Quite informative. I like the ones with floral fragrance . My husband loves Versace Man perfume. As a fragrance blogger, I totally agree with the important points where to spritz perfume and how to make it last longer. I can’t go out without a fragrance and I also wear some light fragrances at home. It makes me happy. i didn’t know such in depth info abt the perfumes. Nike women is something is like too and use it regularly but my personal favorite is BVLGARI. Thats a great guide to buy perfumes. Would definitely keep these in mind. I always wondered about Eau do cologne.Thanks forn useful buying guide. That’s a detailed information about fragrance. I love wearing perfume on daily basis it feels good . I love your detailed post about fragrance.. Its very helpful for me to buying the right one.. I love EDP and often go for Victoria secret perfumes. This post is quite revelation for me. Loved reading it. These are some really good tips! I have also heard that spraying the perfume in the air and walking into it also has a great effect. What’s your thought on it? That’s a nice post about perfumes. I normally do not differentiate between day and night time perfumes but it seems to be a great idea. Thanks for this… Totally saving it for myself 🙂 wonderful post.